As a suspected sick out grows at the Transportation Security Administration, the Trump team warned excepted federal employees against skipping work. The Office of Personnel Management last week issued a rare unsigned memo to agency heads featuring a round-up of frequently asked questions about the lapse in appropriations. In addition to highlighting the process for agencies to distribute new furlough notifications, required now that the partial government shutdown has surpassed the 30-day threshold, officials stressed agencies’ authority to punish excepted employees if they do not show up for work by labeling them as "Absent Without Leave." When the shutdown first began, the Trump administration sought to be lenient toward absences from excepted employees, who are required to work without pay, in part because the first full week of the partial government shutdown coincided with Christmas and year-end vacations. But as the lapse in appropriations has dragged on, increasing numbers of feds, particularly at the TSA, have begun calling in sick. 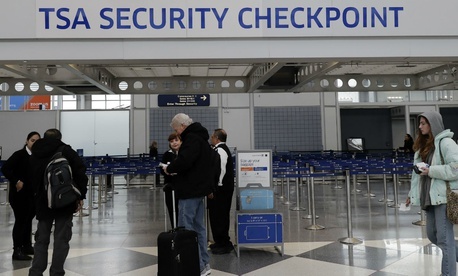 The rate of absent excepted employees at the agency responsible for passenger screenings at airports grew to 10 percent over the weekend, and the agency has suggested it may have to temporarily move employees from one airport to another to cope with absences. In its memo, OPM instructed agencies to consider punitive action toward excepted employees officials believe have been absent either without a “legitimate” reason or as part of a sick-out. The ability of agencies to punish federal employees who do not wish to work without pay is the subject of multiple lawsuits challenging the constitutionality of the partial government shutdown. Federal workers and unions argue that the threat that employees could be punished or lose their jobs if they do not agree to work without pay could constitute violations of the Fifth and 13th amendments of the U.S. Constitution. A hearing on these lawsuits is scheduled for Jan. 31. OPM’s memo also seeks to help excepted employees whose transit subsidies have been suspended as a part of the shutdown. Although those workers are still required to pay out of pocket for their transportation to and from work, OPM said they will be able to apply for reimbursement after agencies reopen.